It's that time of the year: the time when we here at 4seating wrap up the year in film. The year provided us with no shortage of surprises, which perhaps climaxed with the full-blown international incident that accompanied "The Interview". Interest in the bedeviled film was so high, that it managed to gross a very respectable $18 million in its opening weekend, with a limited theatrical release and groundbreaking online streaming. The innocuous action-comedy may yet end up bringing about a paradigm shift in the way Hollywood markets its films, with the online world now grabbing a slice of the pie previously reserved first for theaters. And theaters have a lot to worry about, with the rise in home theaters providing an ideal venue for a movie in online release. 1. BOYHOOD: this film, shot over a period of 12 years, traces the coming of age of a young boy until he reaches his freshman year of college. Being able to witness actor Ellar Coltrane grow up in real time, right before your eyes, is truly astonishing as the scope of the film takes in traumatic family events with a post 9-11 America as its backdrop. The film manages to capture the elusive essence of life even amidst the drama, and is ultimately uplifting without resorting to 'feel-good' cliches. Patricia Arquette and Ethan Hawke give moving performances as the boy's estranged parents. The film is an Oscar favorite, and even President Obama named it his pick for 2014. This is one of the most ambitious and unusual films to emerge from Hollywood in years, if not decades. 2. THE BABADOOK: when William Friedkin--the director of "The Exorcist"--said this was the scariest film he's ever seen, audiences took notice. 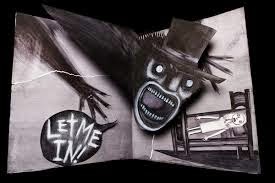 An Australian indie film shot on a low budget, "The Babadook" dispenses with makeup and gore and goes for eerie psychological thrills, as a monster from a children's book comes to life and torments the mother of a mentally disturbed six-year old boy. When we do see the monster, it is one modeled after century-old designs, as if ripped out of a Victorian nightmare; director Jennifer Kent insisted that it be a real figure, neither constructed or enhanced digitally. As the mother slowly descends in to madness, her performance keeps you locked at the edge of your seat. 3. 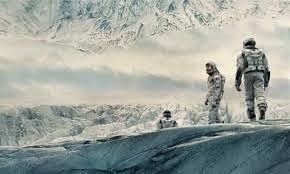 INTERSTELLAR: Christopher Nolan has rapidly risen to become one of Hollywood's most intelligent directors of sci-fi blockbuster fare. He followed up the uber-complicated hit "Inception" with this space opera, which focuses on the search for habitable worlds by means of a wormhole that has suddenly been detected near Saturn. A father's fractured relationship with his daughter is at the heart of the tale, and provides much of the emotional pull. The film finds its way to distant planets of oceans and ice, but kicks into a higher gear when it gets all quantum physics on the viewer. The film is elegantly constructed, but you'll need to put your thinking cap on to fully appreciate what is happening on screen. 4. 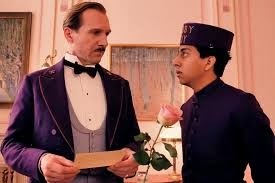 THE GRAND BUDAPEST HOTEL: another quirky, quasi-surreal comedy from the mind of Wes Anderson, this delightful romp centers around the relationship between a hotel concierge and his lowly assistant, as the former is framed for murder. The young boy helps his mentor escape prison and find the real perpetrator, but the plot isn't really the focus, here--it's all about the decidedly bizarre series of events that are set in motion by what happens. The film's wry, European sense of wit will make it another Oscar favorite, for sure (it's already snagged several Golden Globe nominations). 5. 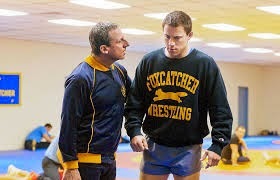 FOXCATCHER: this chilling film was based on the real-life story of wealthy heir John DuPont and his bond with two wrestling brothers, who he ropes into his inner circle as he trains them for Olympic gold. Comedian Steve Carell was praised for his utterly astonishing transformation into the unsettling character of DuPont, although Channing Tatum also gives the performance of his career (at least, to date) as the younger brother. The film deviates from the real story in several significant ways, but this does not detract from the underlying sense of doom which permeates every frame. The ending will shock anyone not familiar with the tale, not so much because it comes as a surprise, but because there is so little explanation for it--and that's exactly how it was in real life. Even those who have no interest in the sport of wrestling will find this a gripping watch. There were, of course, many other fine films this year that did not make this list. Think I missed a few? Let us know!